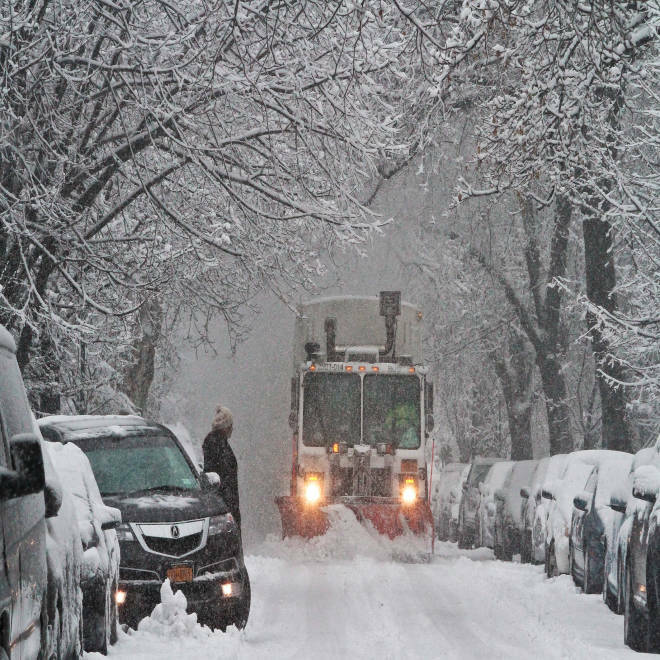 A snow plow waits for a vehicle to move out of its parking spot in Brooklyn's Flatbush neighborhood on Monday Feb. 3, 2014 in New York. The first of three storm systems expected to pound wide swaths of the country over the next week was leaving the Northeast on Monday night after dumping several inches of thick snow, snarling traffic, and shuttering schools. Fat flakes turned the streets of Philadelphia and New York into a sea of slush, casting a pall over morning commutes just one day after the Seahawks trounced the Broncos amid unseasonably balmy East Coast weather in the 50s. Hopeful passengers are settling in for extended delays, as flight disruptions are slated to cost $2.5 billion. At least two deaths and one serious injury could be blamed the storm and its clean up: In western Kentucky, where the snow began to fall Sunday, a 24-year-old man died after his car skidded into a snowplow, officials told NBC affiliate WFIE. And in New York, a 73-year-old man was struck and killed by a snowplow that was backing up on a Brooklyn street, police told NBC New York. Meanwhile, a 10-year-old girl remained in serious condition Monday evening after she was impaled in the back by a metal rod while sledding north of Baltimore, Md., the AP reported. The storm was slowly moving out over the Atlantic Ocean Monday afternoon — leaving room for another wild system that forecasters expect will swing in from the Plains with ice, snow and freezing rain on Tuesday evening. The National Weather Service reported roughly 8 inches of snow near Frostburg, Md., while areas of southern Ohio and West Virginia were slammed by about 10 inches of the white stuff. Snow totals in Philadelphia ran the gamut from 3 to 9 inches; New York City was hit by as much as 7 inches by the early afternoon. The system forced government offices, courts and schools to close in parts of Connecticut, Delaware, Maryland, New Jersey, Ohio, Pennsylvania and West Virginia. Cars came grinding to a halt as speed limits were reduced on many major highways throughout the region. In New Jersey, Gov. Chris Christie declared a state of emergency with travel conditions hazardous — unwelcome news for football fans trying to get out of the Garden State after the Super Bowl -- and nonessential government employees were sent home early. Arizona Gov. Jan Brewer was among the stranded travelers after her return flight to Phoenix was nixed Monday, a spokesman told The Associated Press. Brewer attended the Super Bowl as part of the ceremonial handoff of hosting duties. Next year’s big game will go down in Glendale, Ariz. Millions are in the path of yet another winter storm about to blow through the U.S.
By midday, the flight-tracking website FlightAware reported upwards of 4,3000 delayed flights and 1,900 canceled flights across the country in cities including Philadelphia, Newark, N.J., and New York. Inbound flights to those major travel hubs were pushed back one to three hours due to the snow and ice. The second storm is expected to slam the Midwest and Ohio Valley on Tuesday, dumping up to 10 inches of snow in Kansas and between 3 and 6 inches in Chicago and Detroit. By early Wednesday, the northeast will be shivering again, as freezing rain, snow and sleet are expected to blanket the streets, rattling the morning commute. “They’ll have a break Tuesday and then the next storm will bear down on them Wednesday morning,” Walton said. Nebraska, Kansas, Illinois, Indiana and Michigan could also all get 6 or more inches of snow between Tuesday and Wednesday, The Weather Channel predicted, and Walton said the Mississippi Valley could also see some of the white stuff. Starting Tuesday, ice could also accumulate and threaten power outages in western Pennsylvania, western Maryland, northwest Virginia, and eastern West Virginia. A third winter storm could also have a high impact on the Rockies on Friday, with a wintry mix across the Tennessee Valley, Walton said. Millions in the U.S. have already suffered from an unforgiving winter, especially through the month of January. And last week, Southern states like Georgia and Alabama were caught flat-footed by just a few inches of snow — leaving motorists and school children unable to get home.